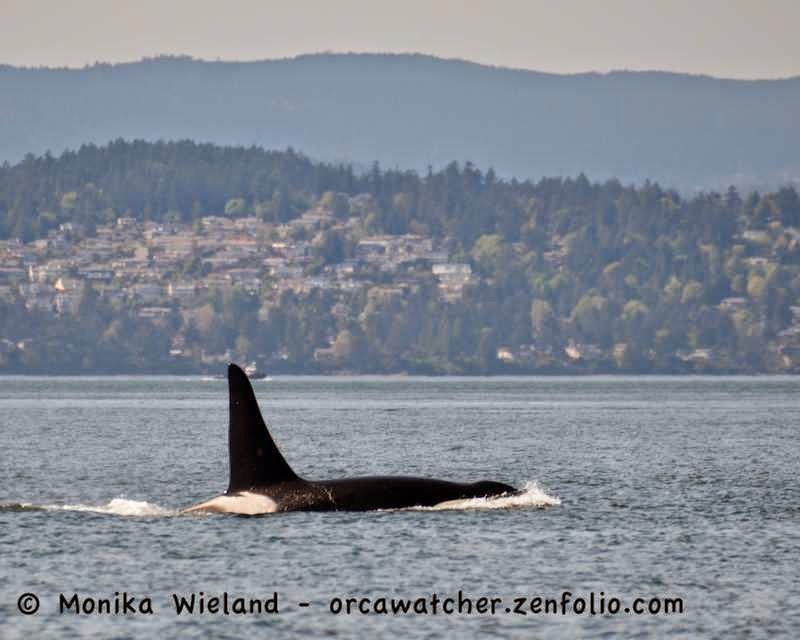 It's been a busy month, which means I've gotten way behind on blogging! 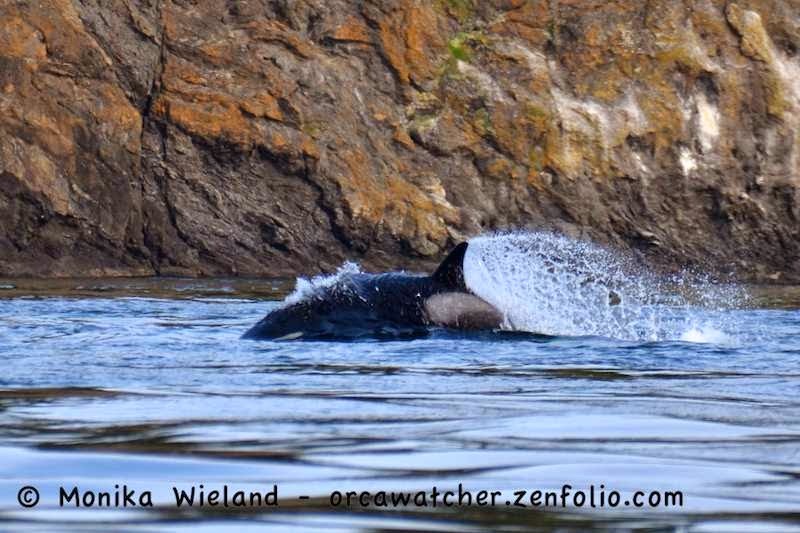 I've got so many photos to share, so I'll see if I can't catch up a bit this week. 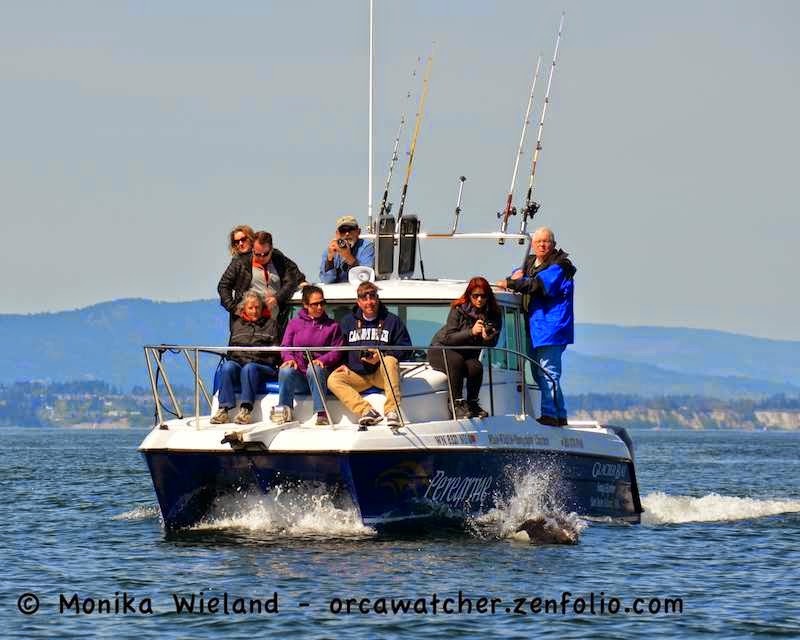 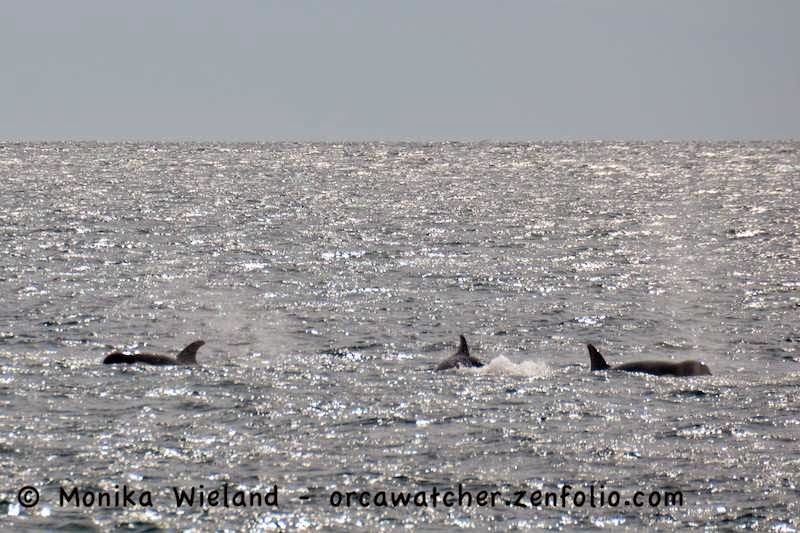 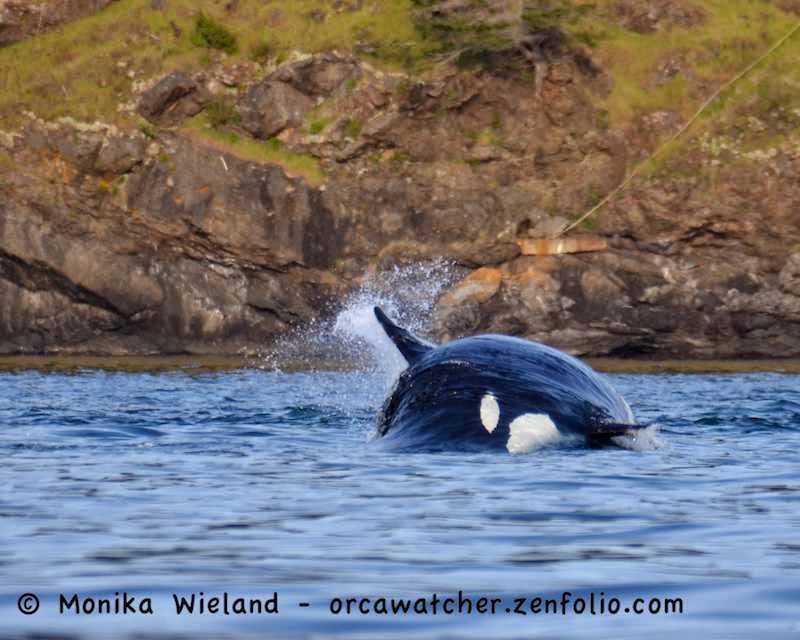 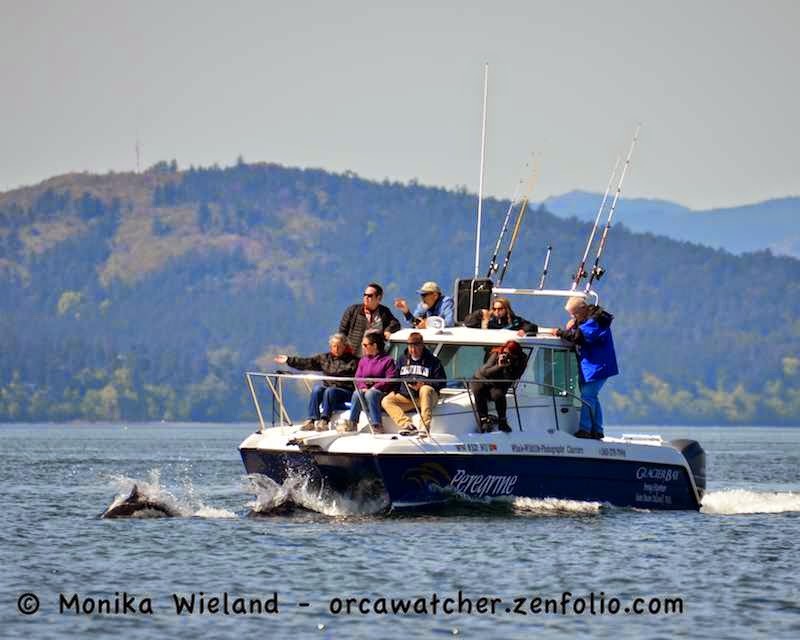 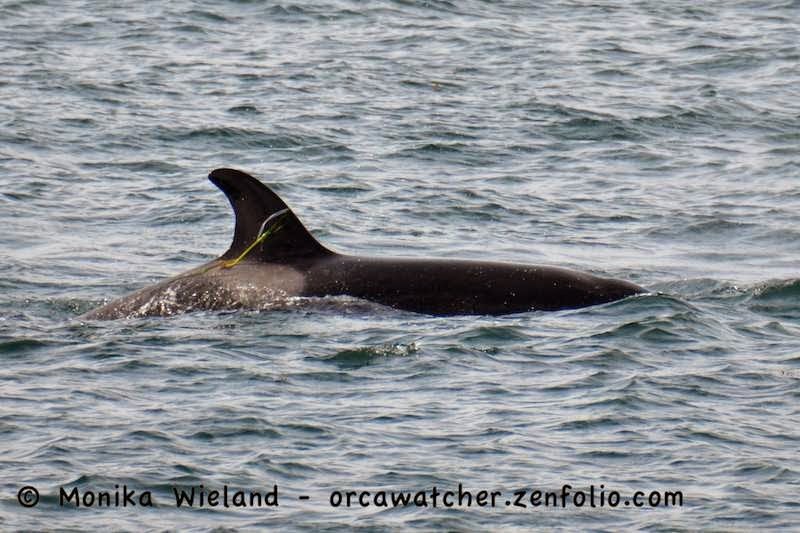 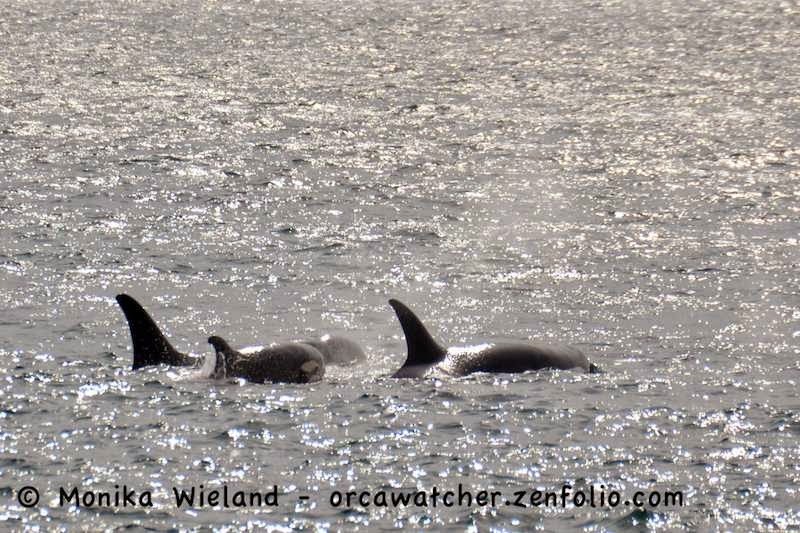 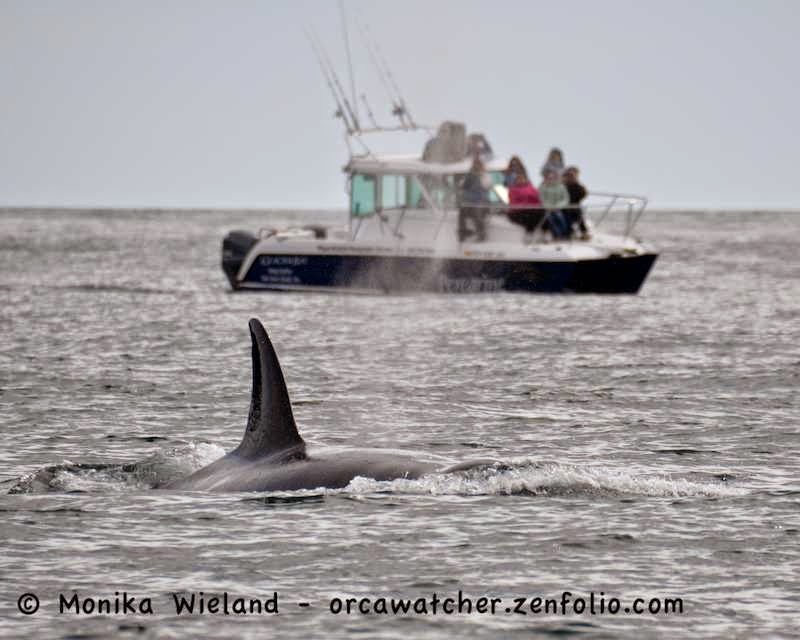 I'll start back on April 18th when in the evening we got out on the water on our boat and met up with the T65As, T65Bs, and T75Bs (a total of 10 or 11 whales) in the northern part of Haro Strait. 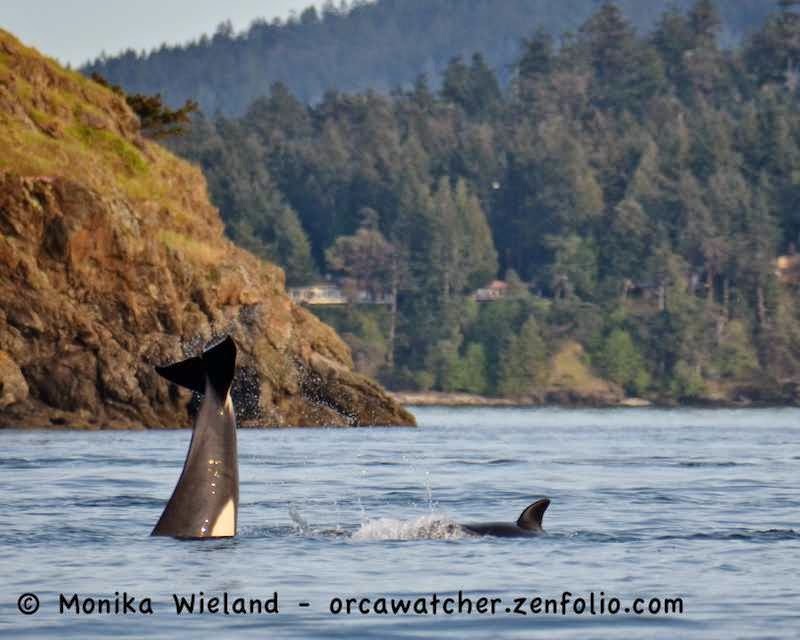 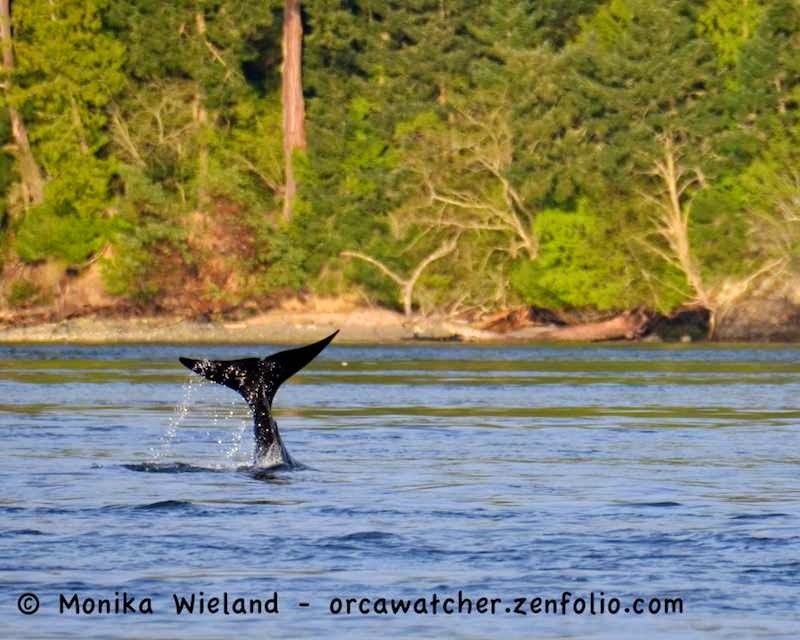 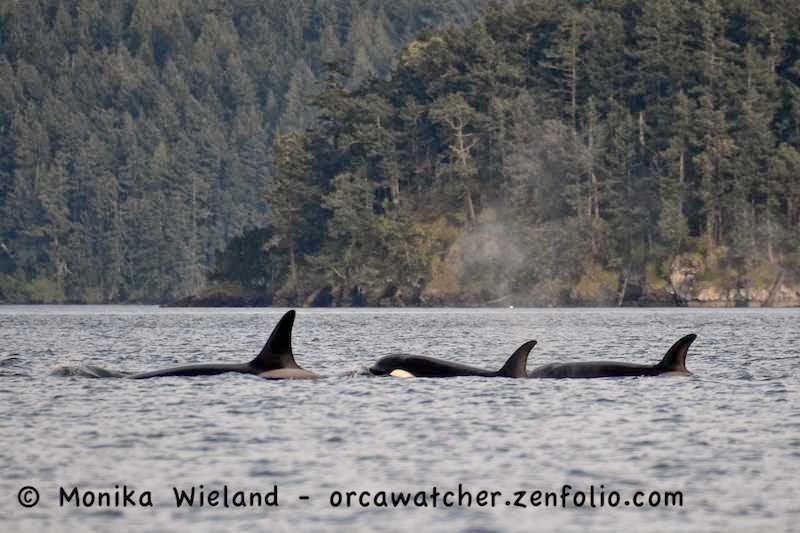 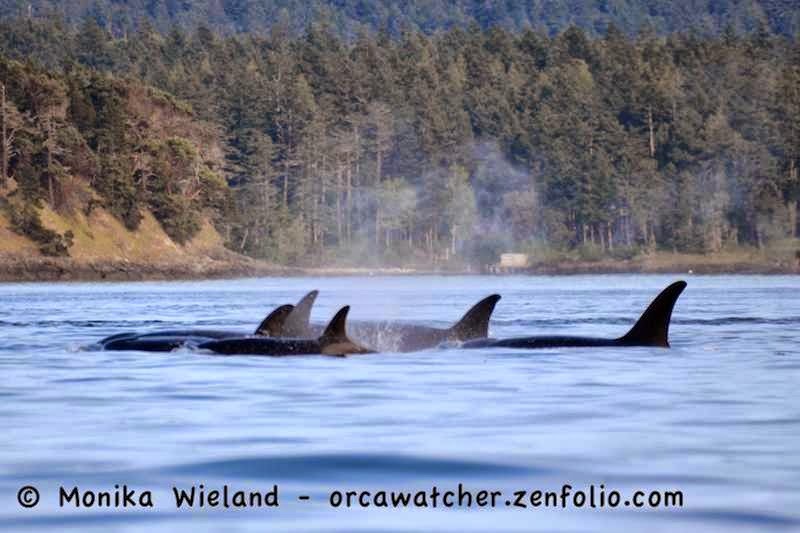 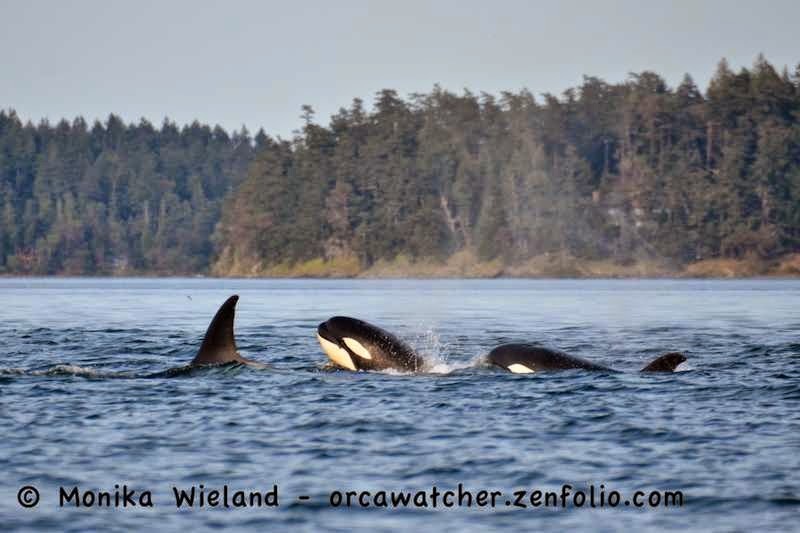 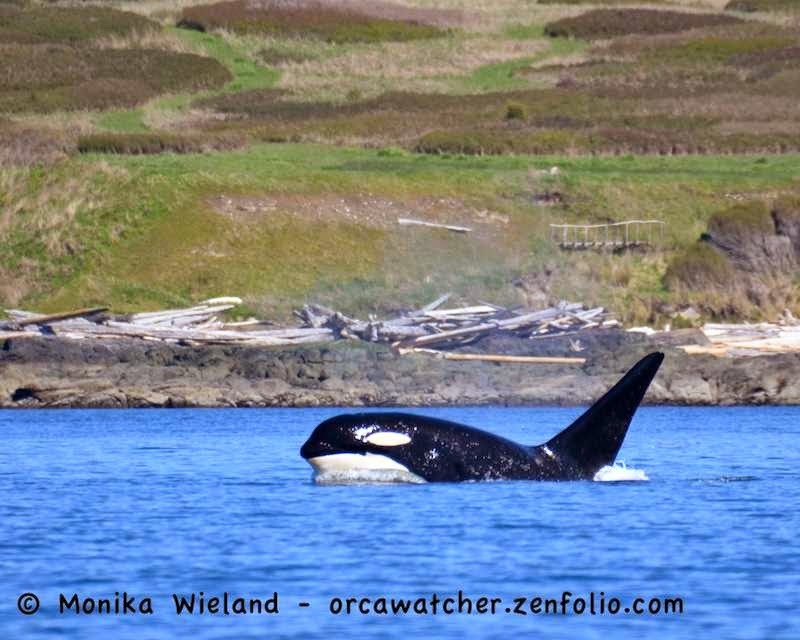 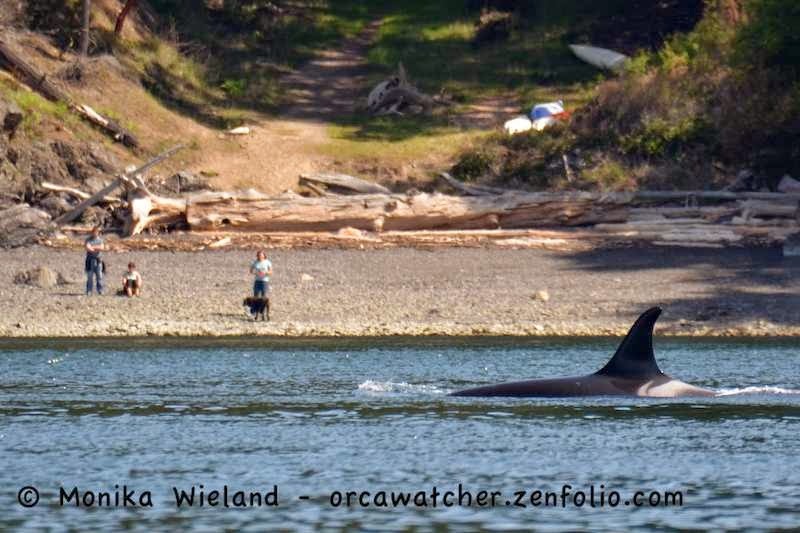 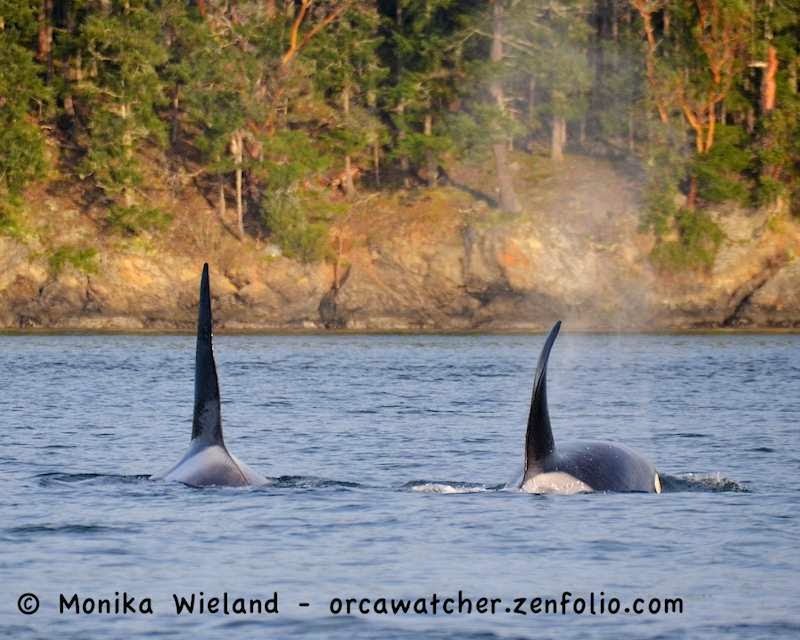 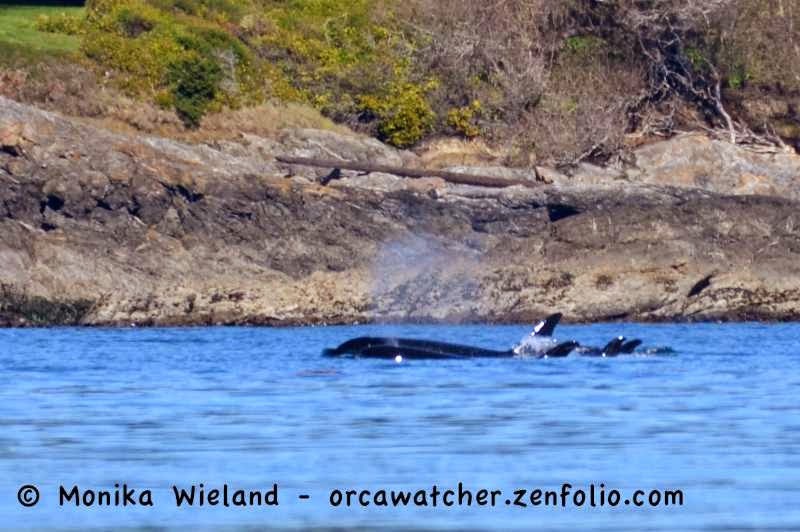 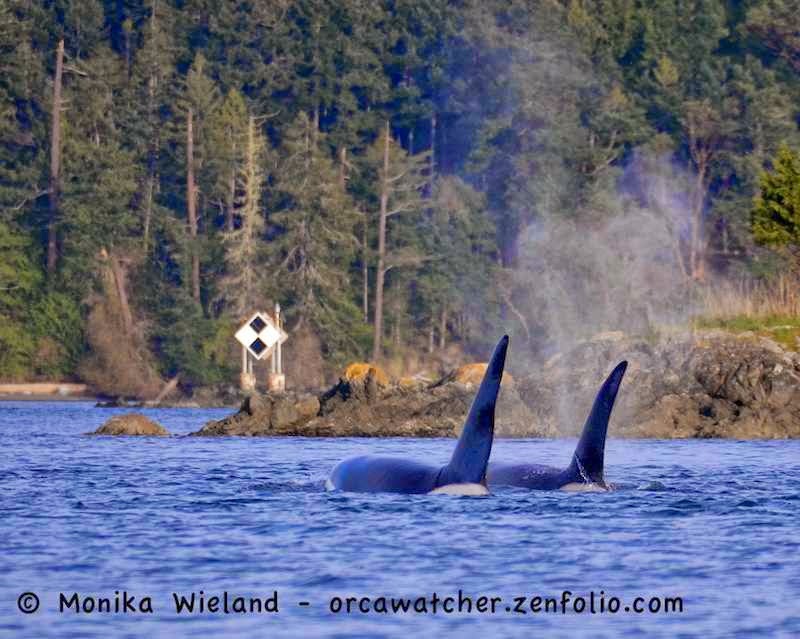 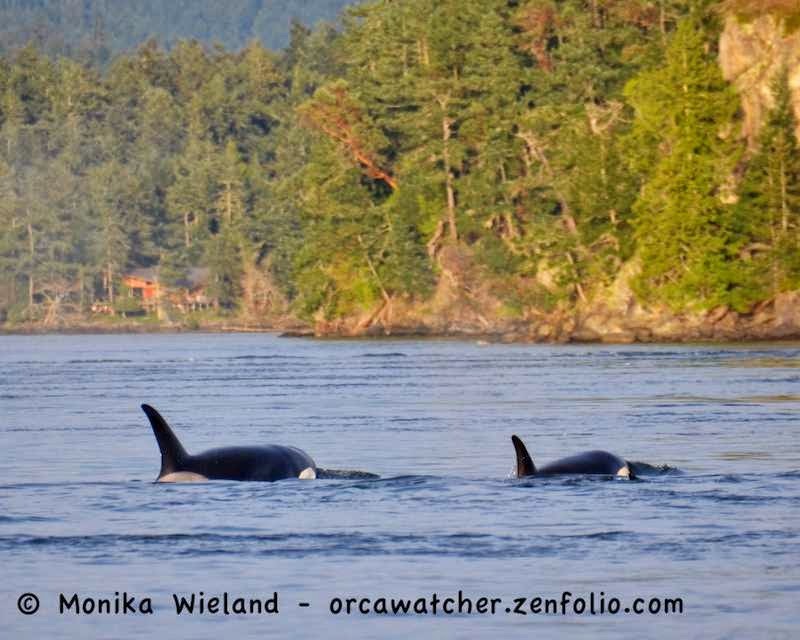 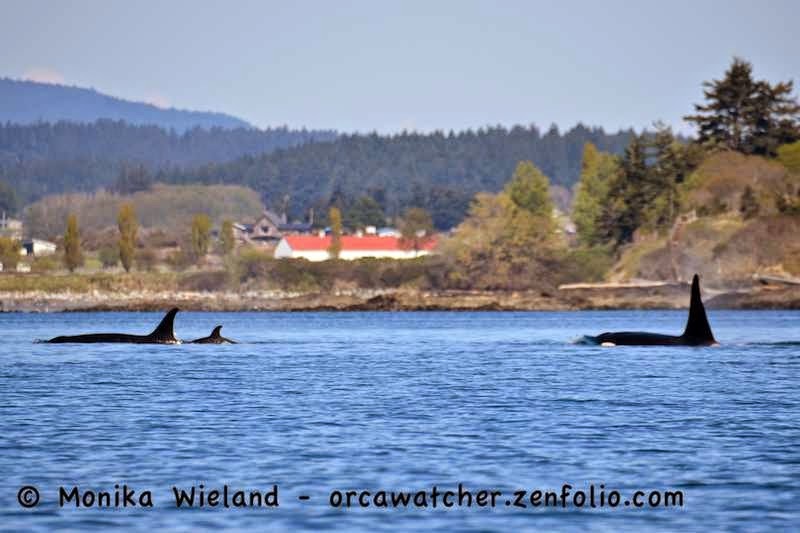 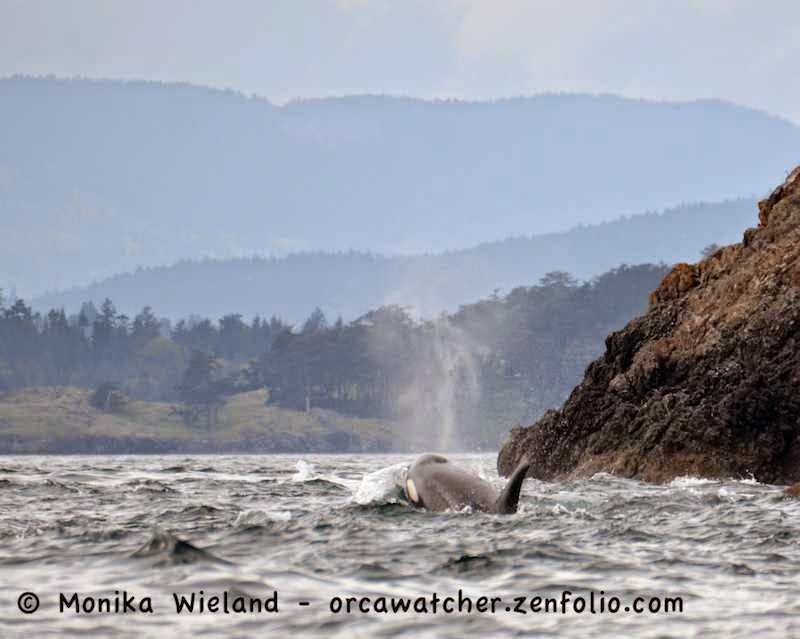 A friend of mine had spotted them from shore on the west side of San Juan Island and thought she had seen close to 10 whales, but when we got out there we could only see four - members of the T65As. 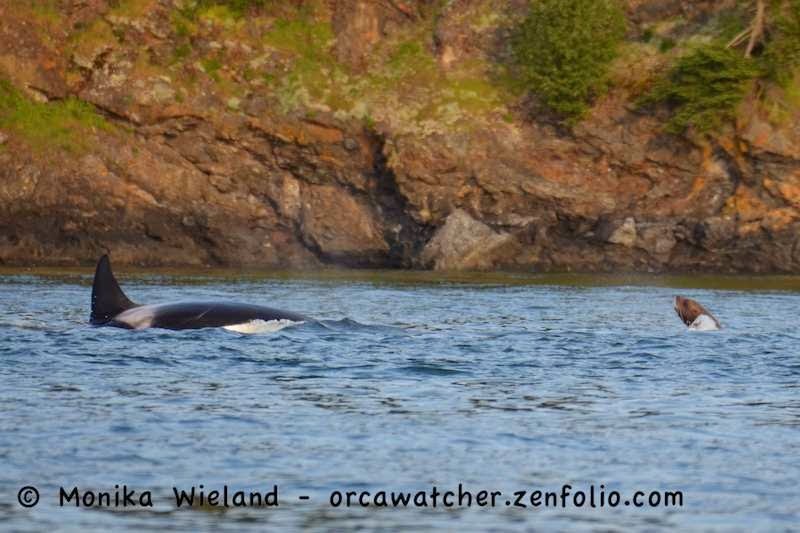 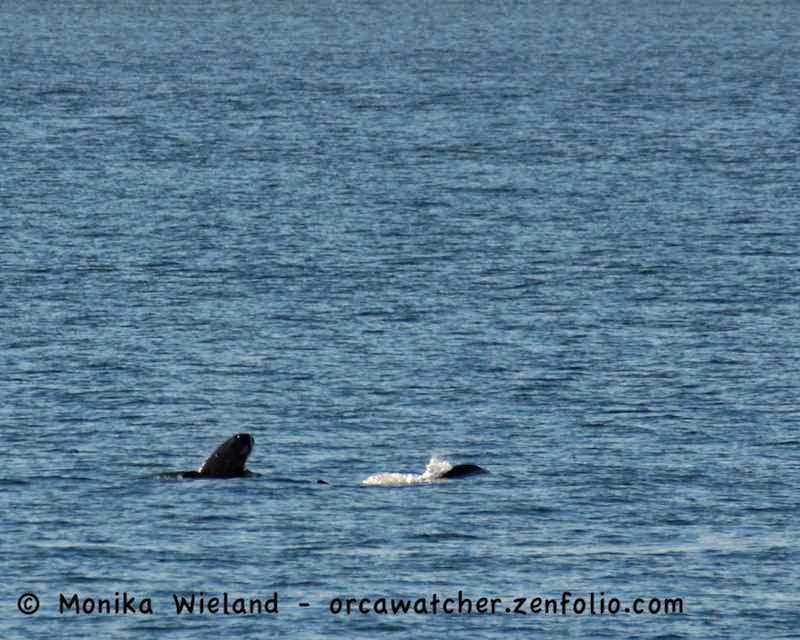 It's amazing to me how small the Steller sea lion looked next to a whale! 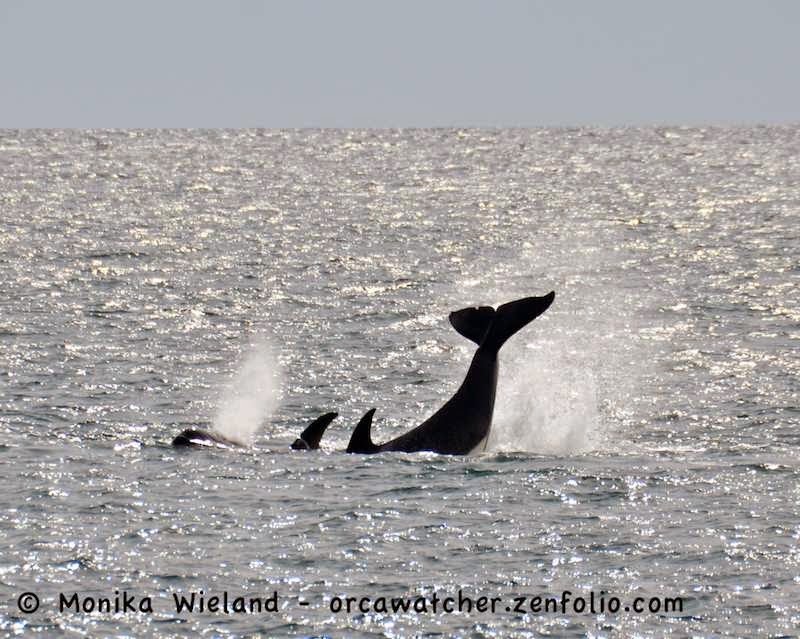 I'm usually impressed with their size, weighing it at up to 2000 pounds. 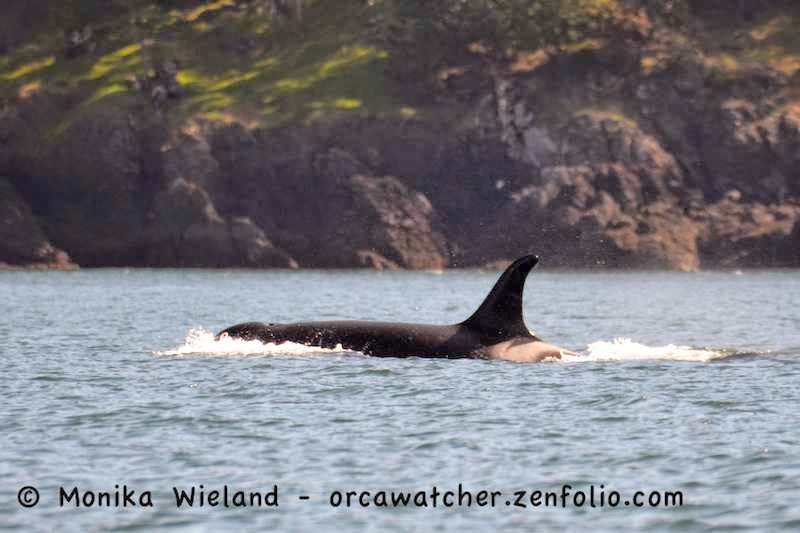 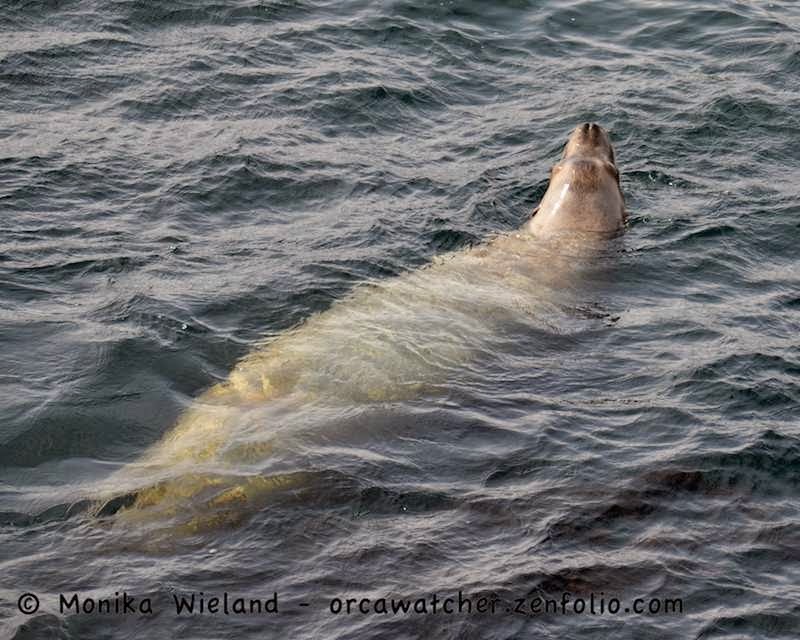 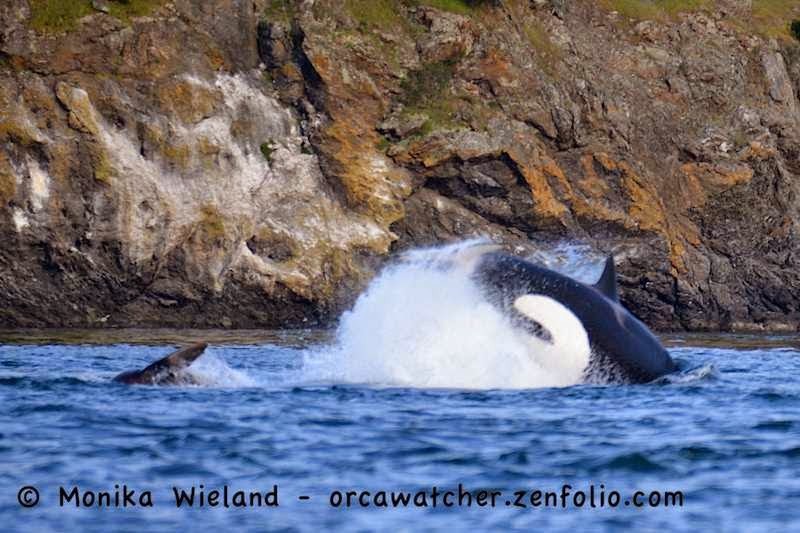 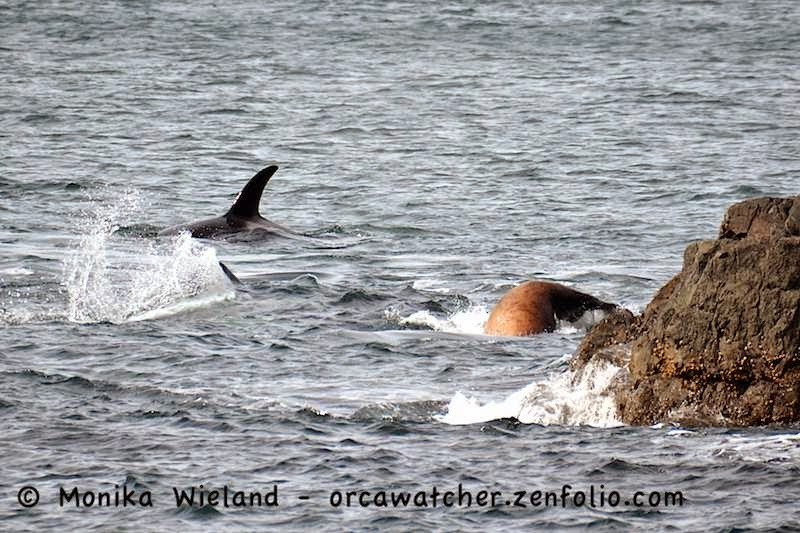 Interestingly, it was the T65As that I saw briefly harass a Steller sea lion off Lime Kiln a few weeks ago. 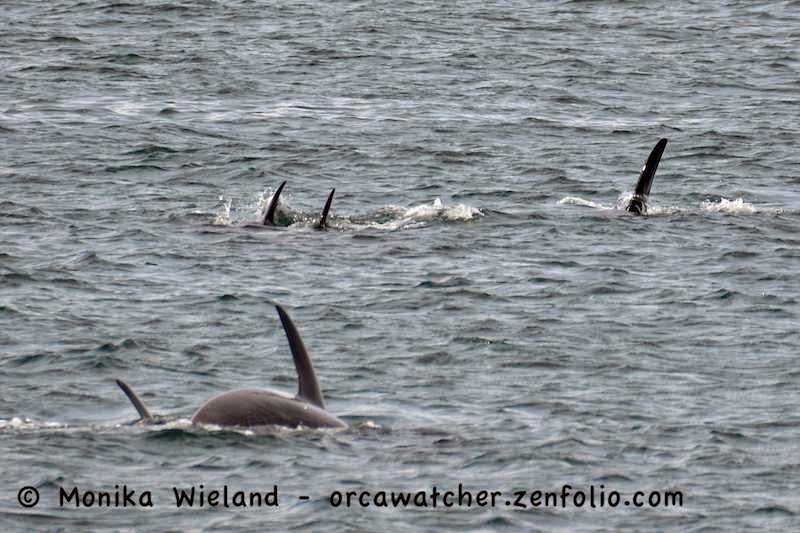 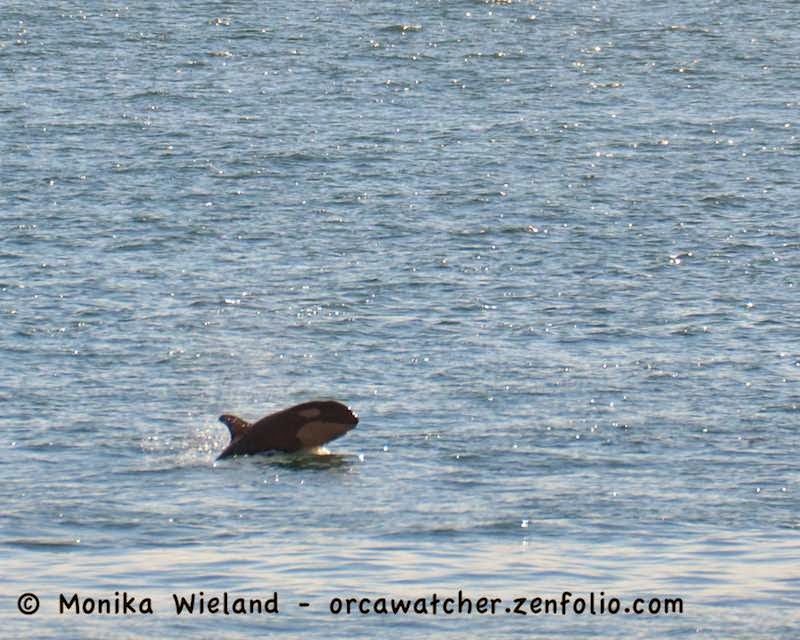 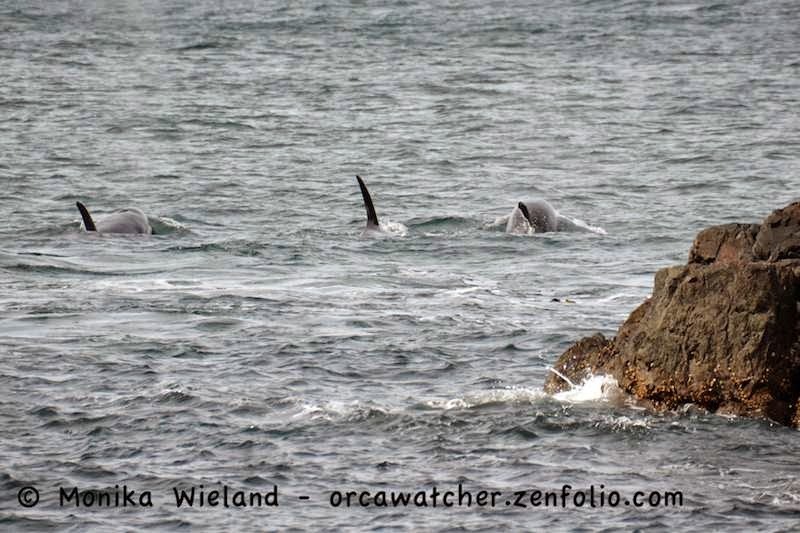 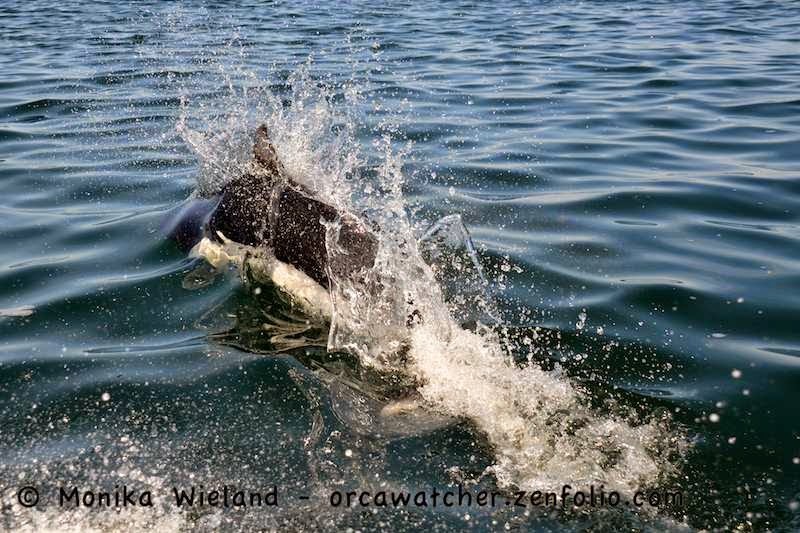 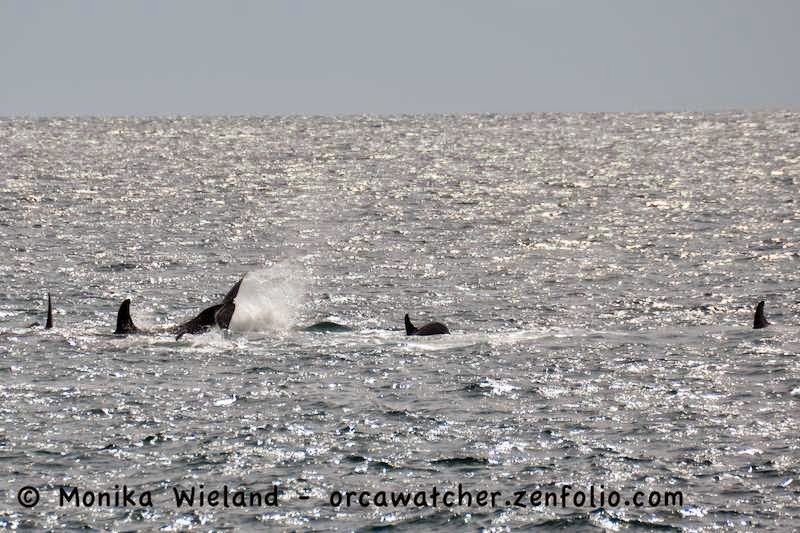 With so many young whales in this group, it seemed to be a training exercise as they all played cat and mouse with the sea lion. 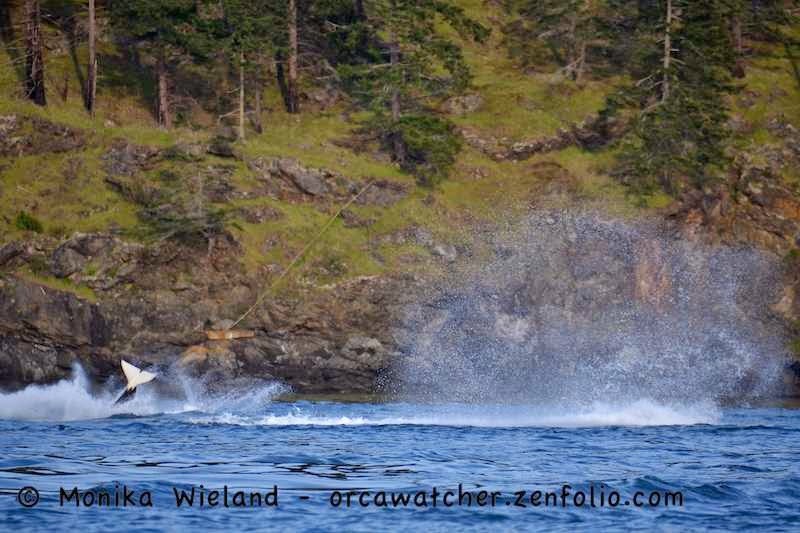 There was a lot of white water throughout the very dramatic pursuit! 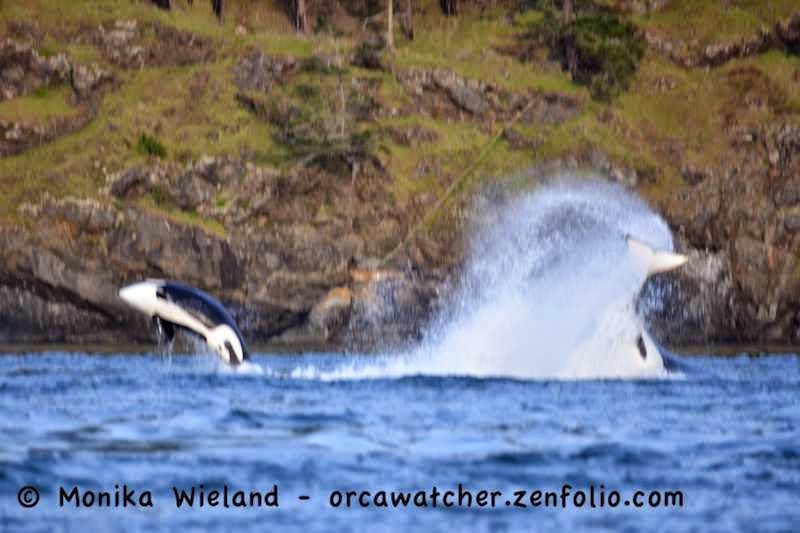 I got so close to getting an amazing photo on this next one where one whale breached as another one simultaneously cartwheeled, but it turned out blurry!! 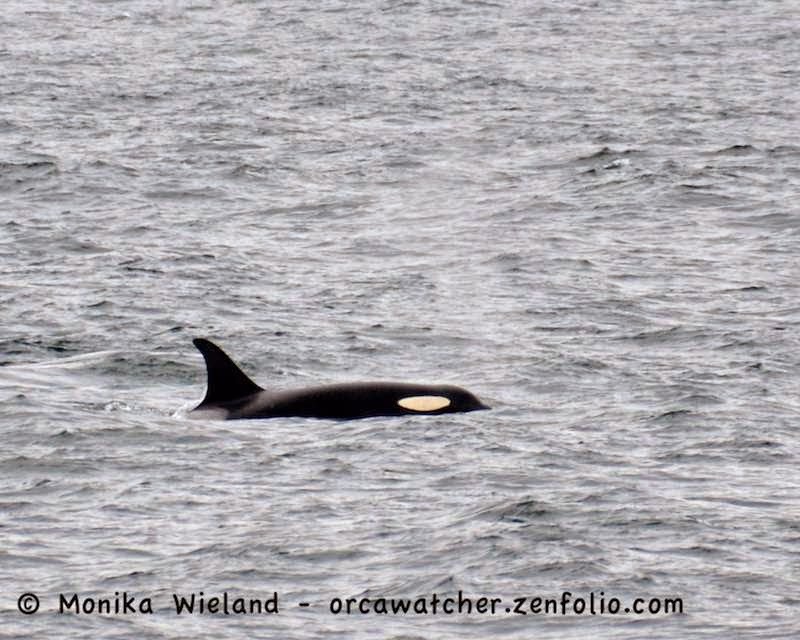 The little calf in the picture above is T75B2, probably only about two weeks old in this photo. 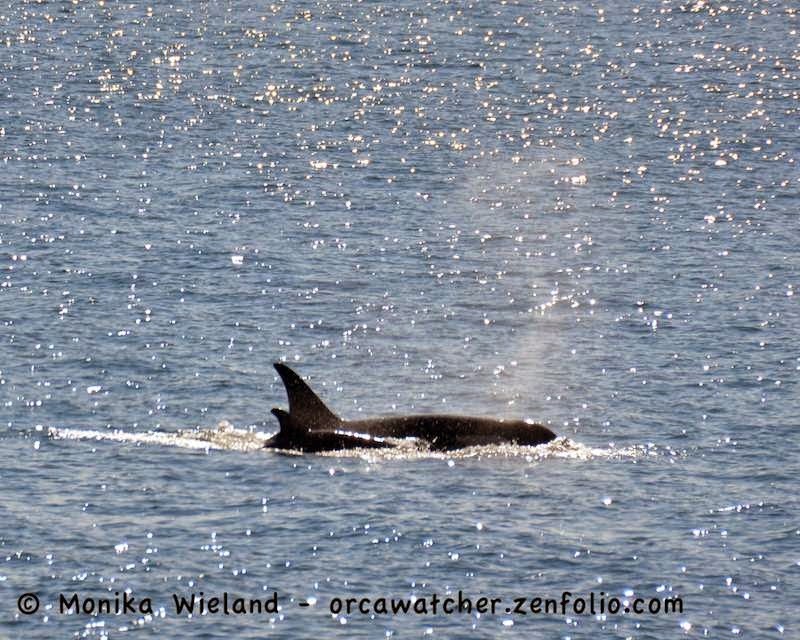 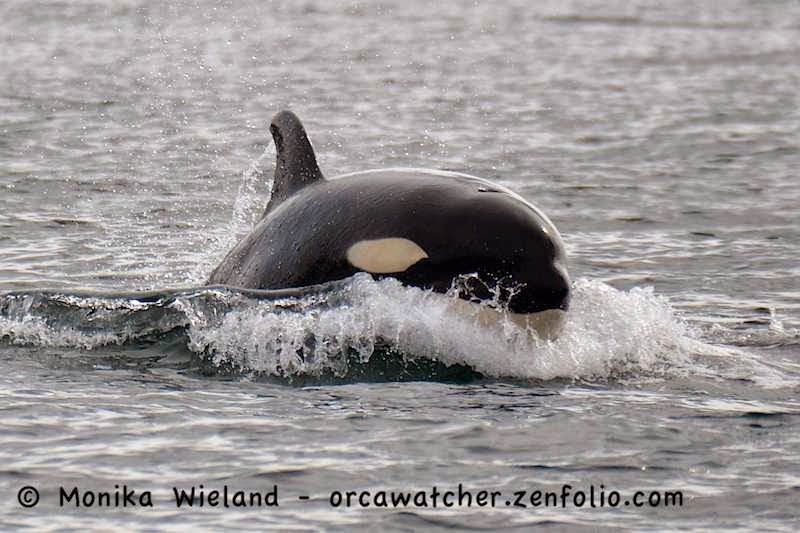 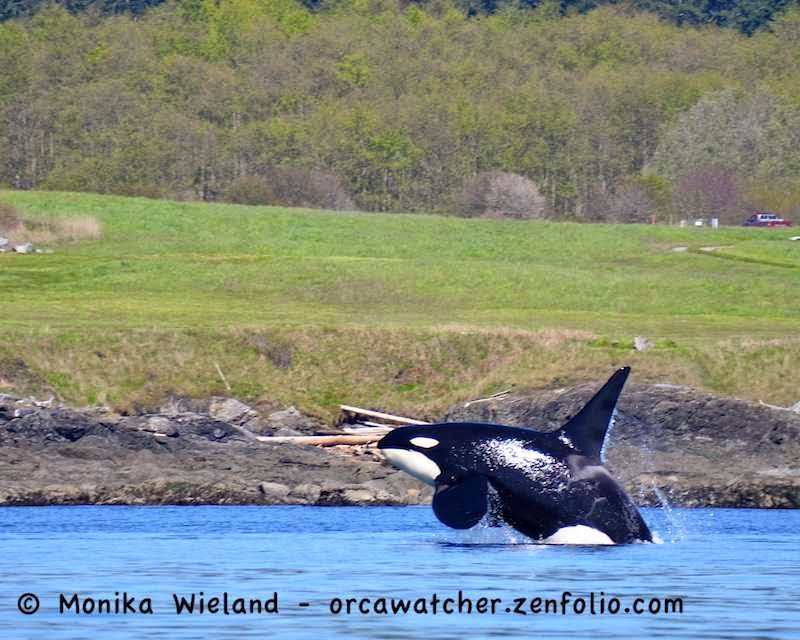 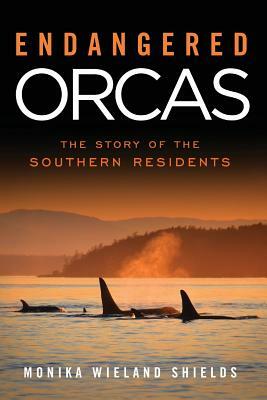 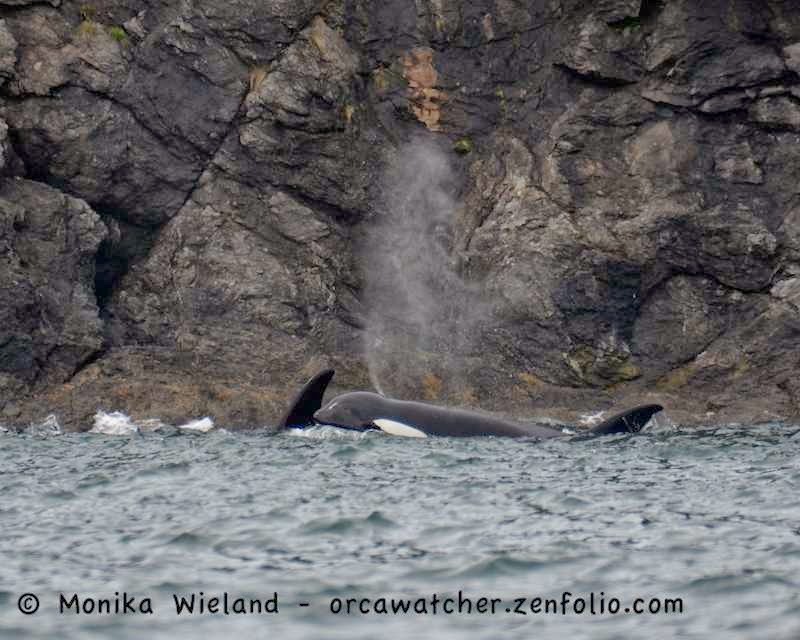 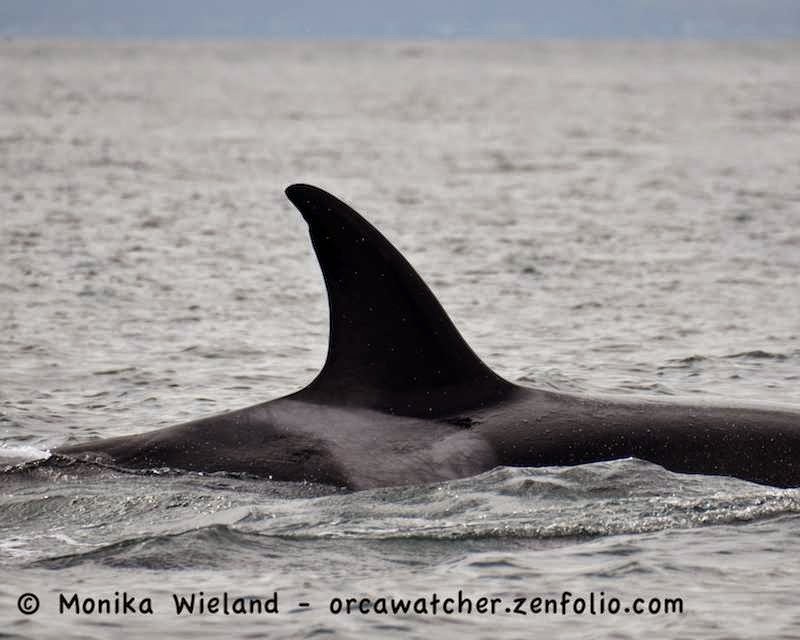 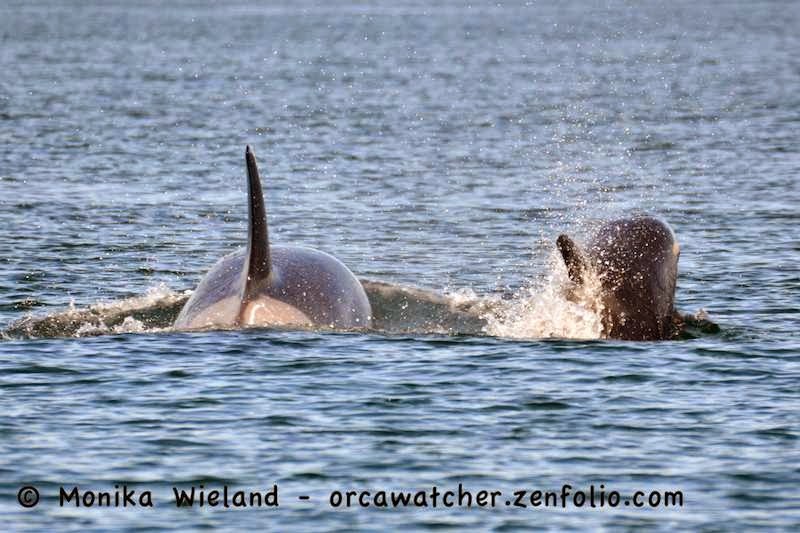 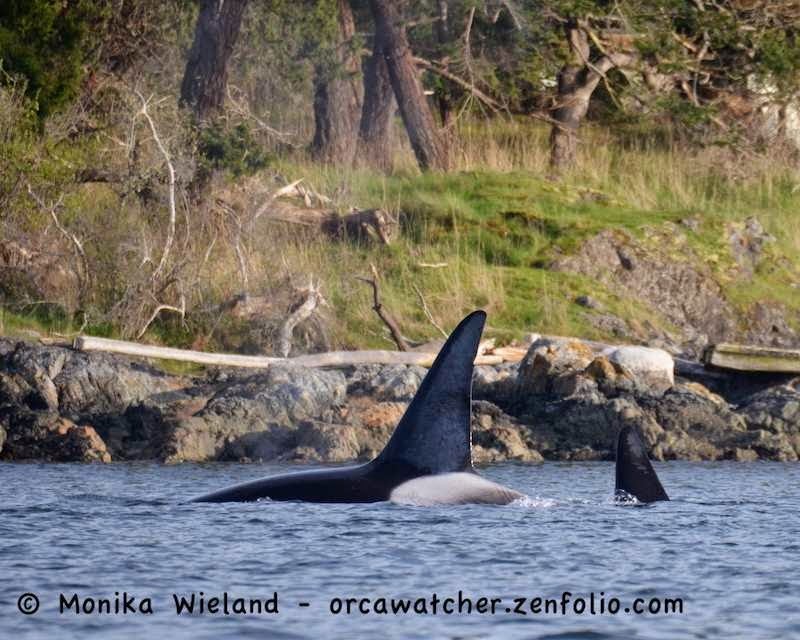 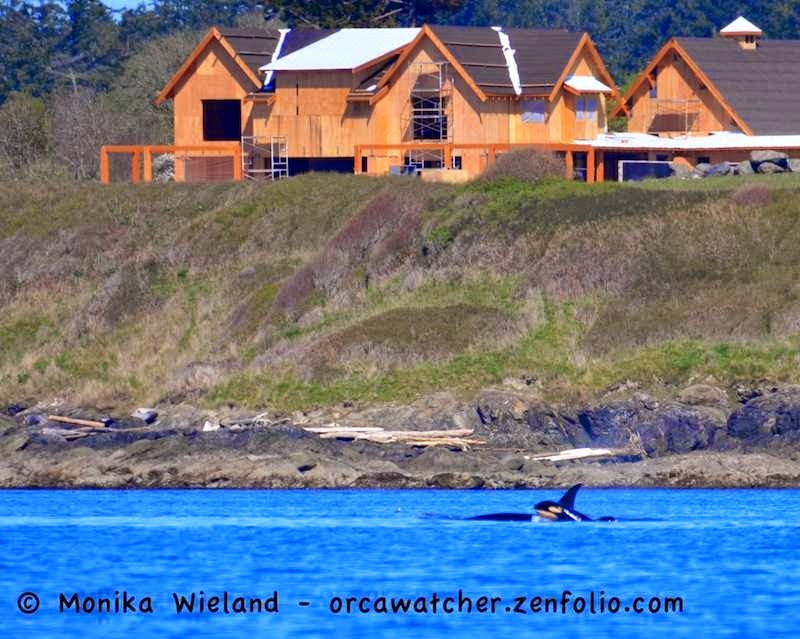 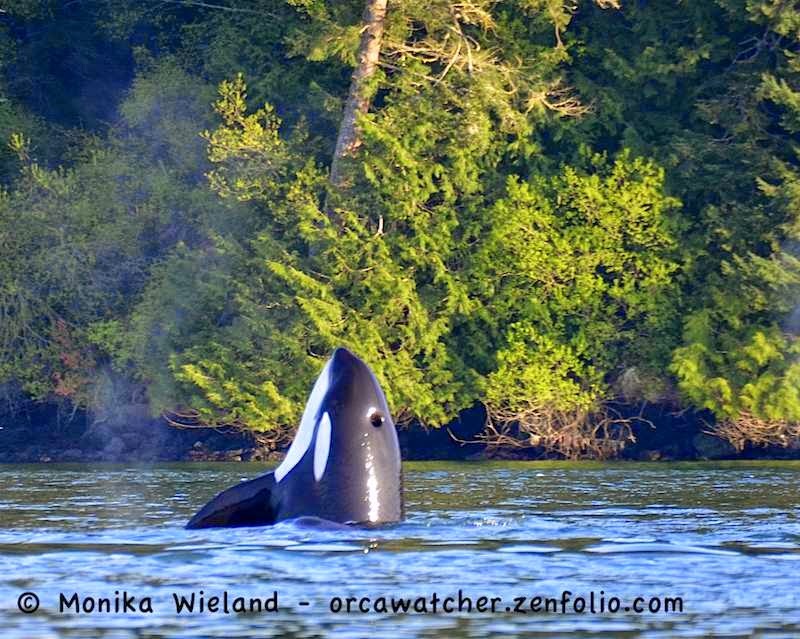 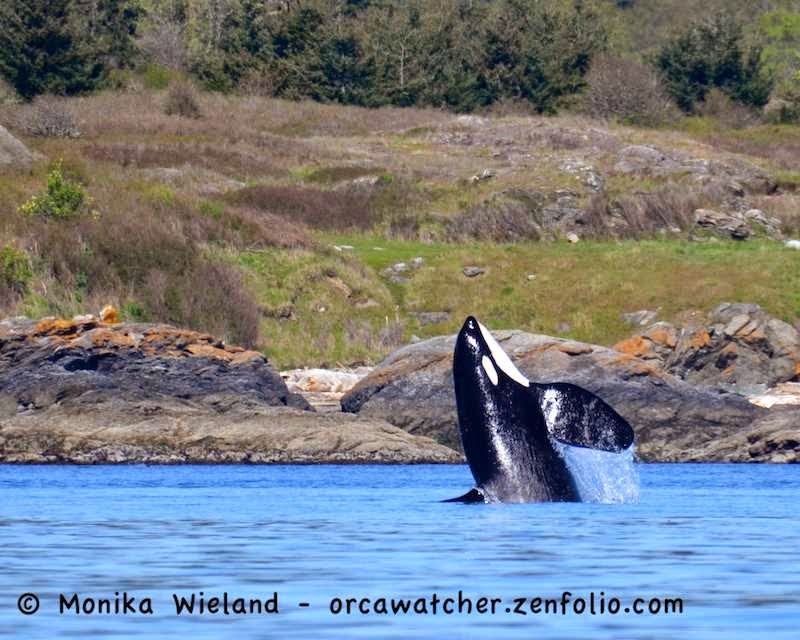 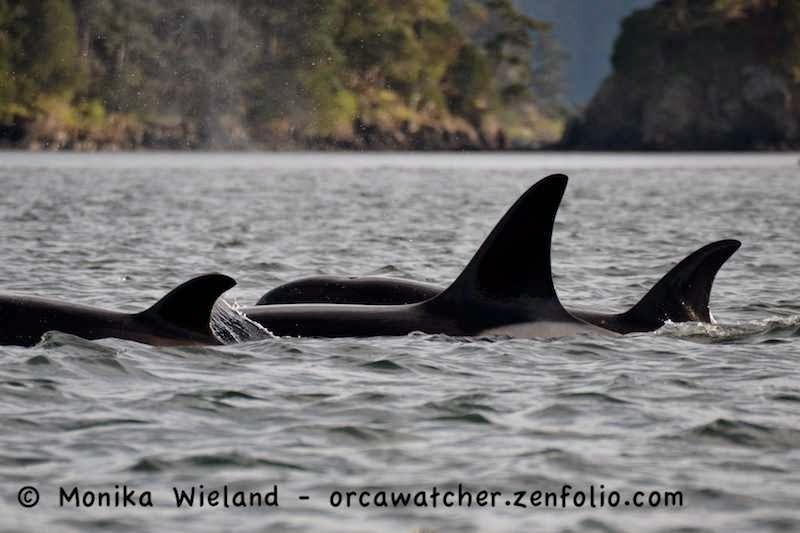 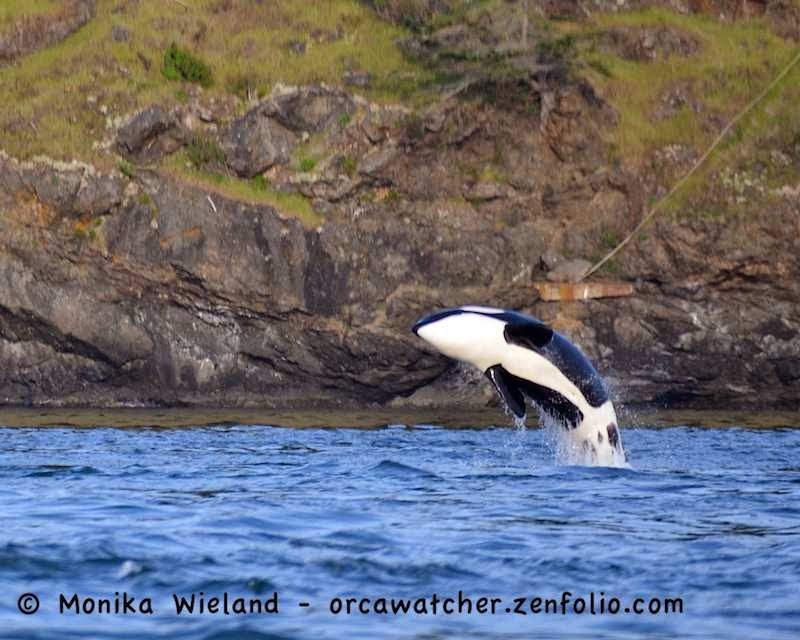 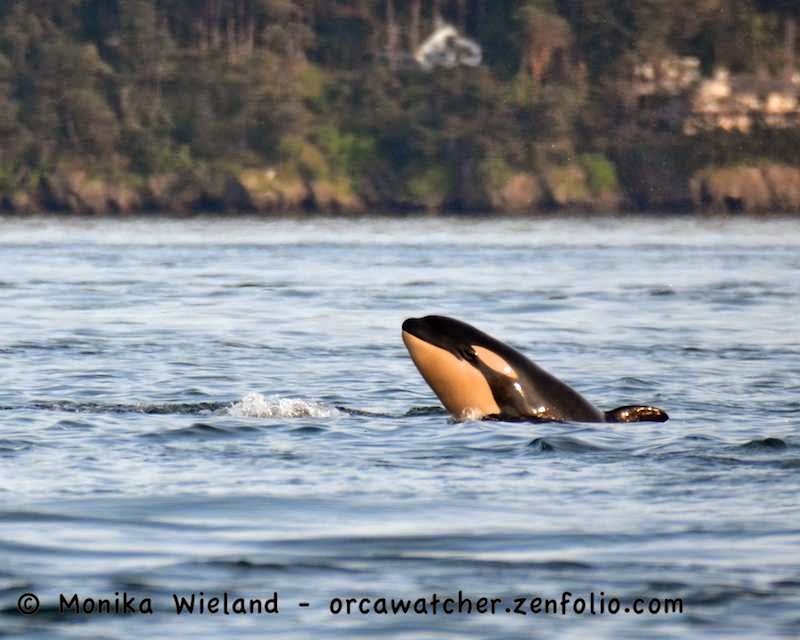 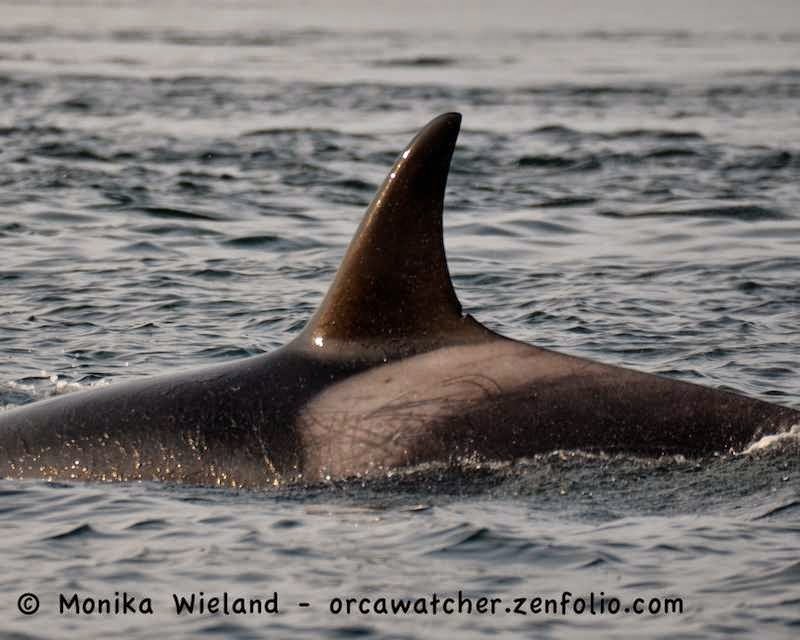 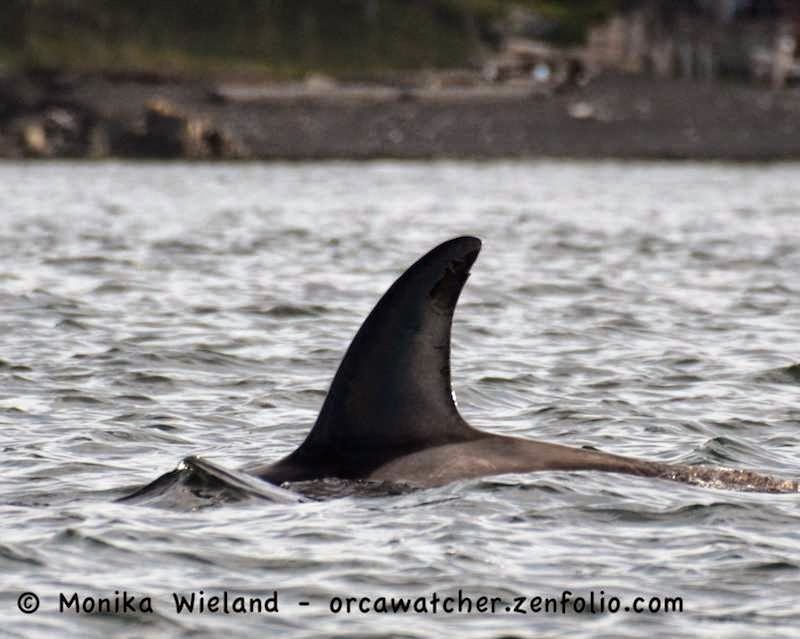 It's nice to see a killer whale baby boom across ecotypes (residents and transients) this spring! 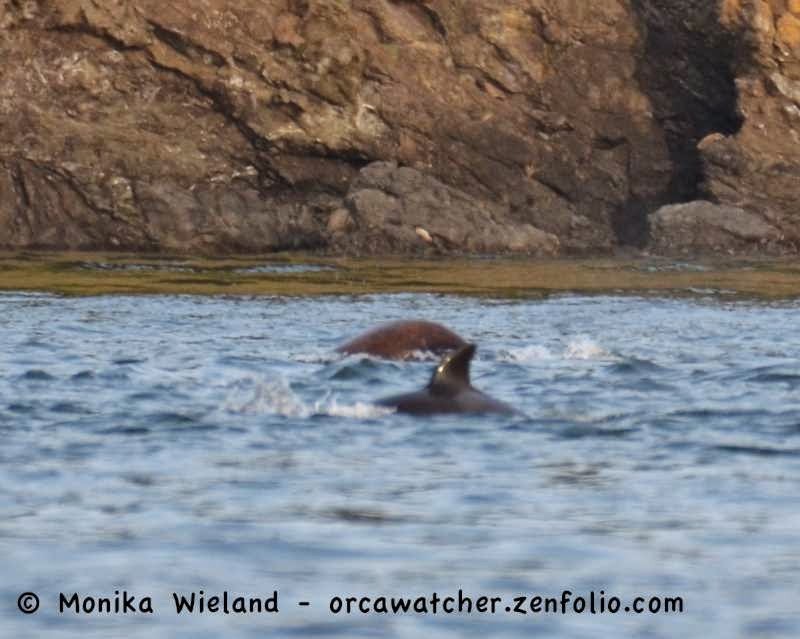 I was surprised they let this little one get as close to the action as they did - while it seemed to be "play" for the whales, the teeth of that sea lion can cause serious damage, especially to a little whale! 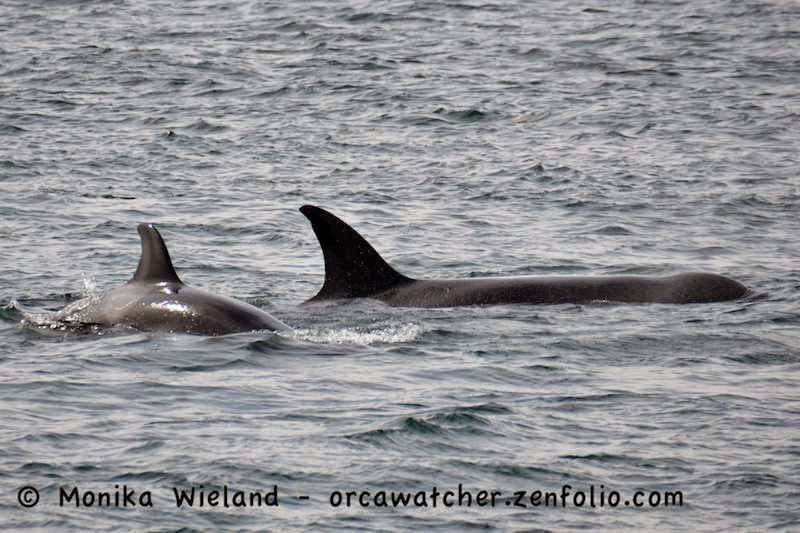 The sea lion was dwarfed by the adult whales, but the calf looked smaller than the sea lion.